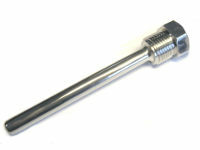 The AMI bulb wells or immersion pockets are used with temperature sensors and transmitters (SD-T, SDB-T, SDC-T1 series) to measure the temperature of liquids. The wells are installed in a standard 1/2" NPT or 172" BSP threaded saddle. The sensors are inserted into the well and are spring loaded. The front part is filled with temperature conducting paste. Important: Sensor tip must reach tip of well to accurately measure media temperature.